On November 12, Alena Adamkova, Alena Adamkova, the executive director and curator of the International Roerich Memorial Trust (IRMT), has been granted the prestigious Indian award, was awarded with the prestigious Indian award “Devbhumi” for her contribution to the preservation and development of Indian culture and art. The solemn ceremony of awarding took place in the city of Simla – the capital of Himachal Pradesh state. Members of the state government, heads of Ministries, influential politicians, eminent representatives of scientific, cultural and creative elite, students of local universities and journalists gathered in the main hall of Geiti Theatre, which is a famous architectural monument. Alena Adamkova was awarded with Order of Friendship in December, 2010 following the Russian President’s decree. Besides the well-known researcher- Indianist, the awardees’ diplomas and memorial prizes in the form of peacock statuettes - the national Indian birds – were granted to the heads of government departments and social organizations. Among them there were people from all walks of life, outstanding personalities in science, literature, education, health and social spheres. The “Devbhumi” award was instituted jointly by the charity foundation “Charu Kasl” and the government department of languages, art and culture to encourage efforts of people taking care of the unique historical ethnographic, architectural, ecological and spiritual legacy of the Himachal Pradesh situated in the Western Himalayas. Granting the award to Alena Adamkova, Kapoor V. Bkhan, founder and president of the Foundation, emphasized that “thanks to her selfless devotion, the former Roerich estate in Naggar turned into the international cultural centre that became not just the most important tourist attraction of the state, but also the centre of attraction for all connoisseurs of art, for creative people all over the world”. He drew special attention to the importance of Russian-Indian cultural festivals held by International Roerich Memorial Trust, in which folkloric groups, artists, musicians, writers and poets of the two countries as well as guests from numerous Roerich societies abroad. 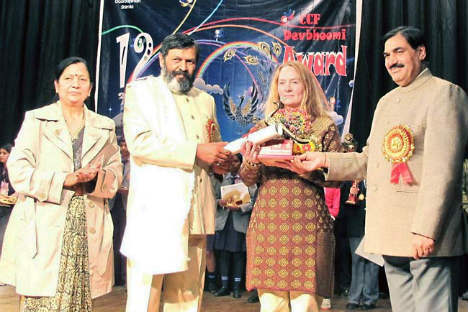 Prem Sharma, director of languages, art and culture department of the Himachal – Pradesh government and an active supporter of the IRMT activities for many years, was also granted the well-deserved award.